Today I started putting together the 20 Daemonettes I have vowed for the ETL and I have to admit that the kit is actually leaving me more than a little stressed out. Maybe it's because I've got so used to contemporary kits dictating the appropriate way that individual models should be built, but sorting out which arms can or should go with each Daemonette really isn't coming easily to me. There are a lot of even very basic things I still haven't got my head around when it comes to working out what goes where. Are the arms on the sprue paired or is their no connection between those opposite each other? Are there left and right arms or can any arm potentially be attached to either shoulder? From my experience, all the arms can go on any shoulder (left or right, any daemonette model) and any head can go on any model. So just put whatever arms and head on that you think will make a nice pose. Edited by Dr_Ruminahui, 11 June 2018 - 04:38 AM. Thanks for the encouragement/advice both of you. 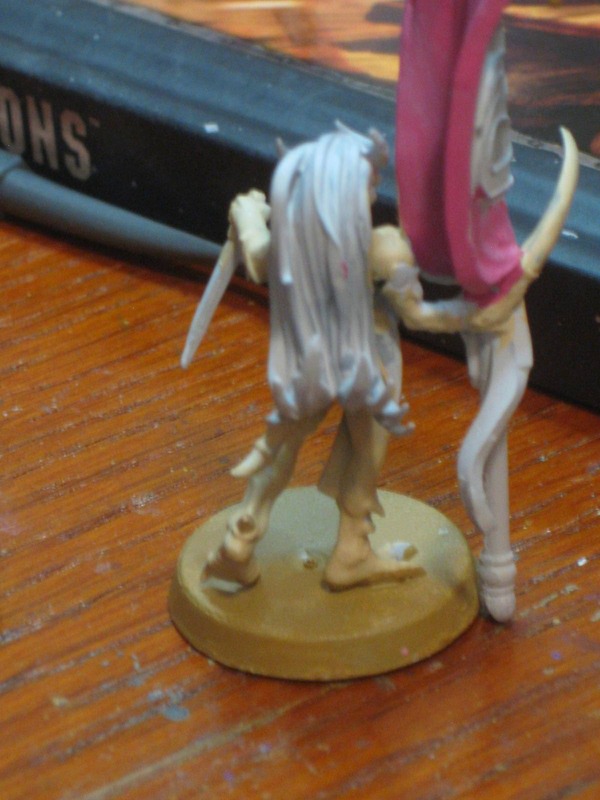 I know you've been doing a unit of Daemonettes recently, Dr_Ruminahui, so could you possibly get me a close up of how your standard bearer's right arm joins at the shoulder? 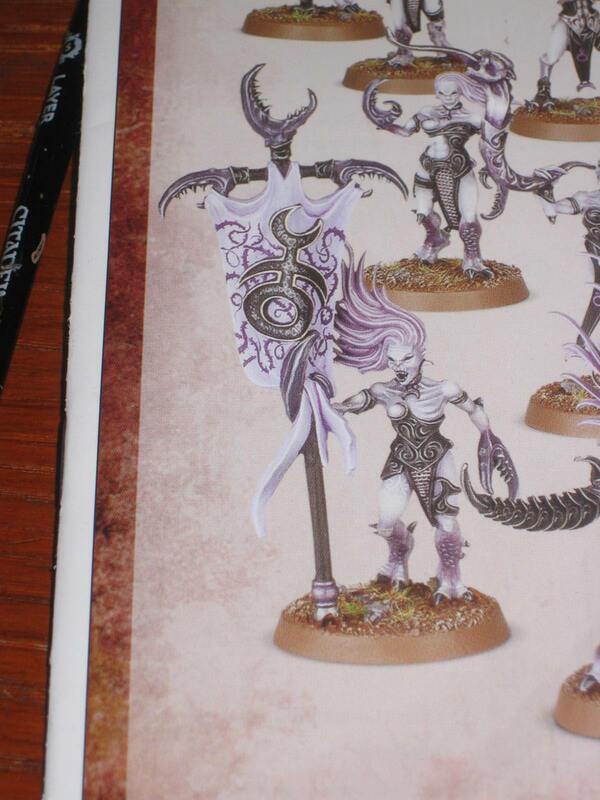 I can't for the life of me work out how those pieces are supposed to go together cleanly so that the model can hold the standard. Here's a pic of mine - I'm in the middle of painting it. What I did was tried to glue both the flag to the arm and the arm to the body at the same time. Both points ended up failing - so don't do that. How I think I should have done is glue the shoulder to the body as snuggly as I could, then the next day glued the flag to the arm. From seeing it together, I figure that would fit as well as what I eventually achieved, without as much danger of the flag breaking off. Now, looking at the picture of the Start Collecting manual, I see what the problem was - I modeled it with the flag arm going down, not out front. Here's how I should have done it. Thanks for all of that. I really appreciate it. No problem - hope it helps. I even used the claws from the seekers I had left over. To get even more variety, I used seeker heads, the heads from the chariot sprues, and mismatched the claws. The kit confused me at first to. If you look at the sprues, before cutting them off... if you haven’t already done so ... they are usually grouped up. By that I mean a toros/leg/claws are close to each other. So you can get an idea of the pose you’re building. I have 30 strong unit I finiseg building about month ago. I clipped everything off, cleaned the parts up, glued bodies to bases and then head to bodies. After that it was sort of taking my time and matching up the claws I thought looked best and every once in awhile looking over the instructions/pictures like the good Dr. suggested.